In year 9 in the coming weeks, we will be viewing Queen of Katwe, the film, as a text, doing related reading of non-fiction articles about Katwe, about poverty, and about the importance of education. We will also be visiting Katwe and taking much needed items with us. We will spend a day trying to make life a little brighter in Katwe. Working with KAYDA, (the Katwe Youth Development Agency), we will be making much needed donations to help improve the lives of some of Katwe’s children and their families. KAYDA’s programmes include; street children rehabilitation, education through music, dance and drama, counseling, sports and HIV/AIDS. These children are struggling with drug and substance abuse, poor to no education, child abuse and starvation. Please bring an adult, child, and teen clothing in good used condition. Please do not bring clothing too worn out to be worn with some pride. Shoes in reasonably good condition are also needed. Many children in Katwe who cannot afford to go to school receive some limited education at the Katwe Youth Development Agency., so school supplies are needed! Shampoo, soap, toilet paper, and body lotion are also needed. If you have collected a suitcase full of travel size/hotel toiletries, donate them now! 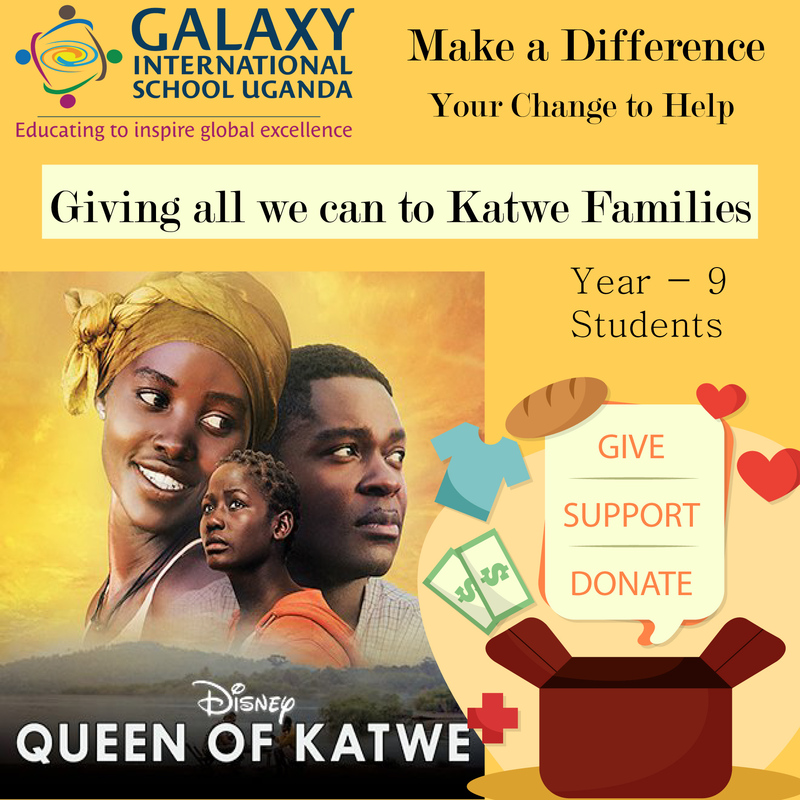 We are very proud of our Year-9 students… They will be making a Galaxy of difference in the lives of Katwe’s children and their families. Note: Turning your donation of gently used clothing, shoes, and sports equipment AND non-perishable food items into comfort and joy for some of Katwe’s kids and their families.